Cathy and Janice Gomes’s expertise, trend knowledge, and artistry will bring out your inner beauty and help you to be the confident person you are meant to be. 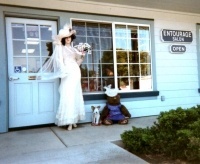 We have over twenty years of salon experience in Old Town Orcutt. Entourage has been in this location for seven years. Feel the warm welcoming atmosphere of our salon and the friendliness of our staff. Pamper yourself with a soothing Pedicure by our expert whose Swedish leg and foot massage will leave you walking on air. Enjoy a salt scrub and purifying mud mask with a hot towel wrap. You will be relaxed and your skin smooth, soft and glowing. Come in for an expert color, haircut and style by our colorists or a conditioning treatment, perm or smoothing treatment. Let Janice and Cathy pamper you. Try the Shellac Manicure. The polish last two weeks and is gentle on your nails leaving them healthy and uncompromised. We have a great selection of color. Add a little bling just for fun. Our Nail Expert strives to keep your nails strong and healthy, and for your skin to be smooth and subtle. Call to schedule an appointment and walk-ins are always welcome.